Taking inspiration from the Harvard RoboBee microbot design, RoboFly is comparable to the size of a bumblebee with a weight of only 190 milligrams (nearly the weight of a toothpick). When an infrared laser is directed at a tiny photovoltaic cell, 250 mW of power allows the robotic insect to take flight. Powering small-scale robots has been a fundamental problem in development. To combat this issue, most tiny robots rely on tethers; RoboFly instead explores the use of lasers. 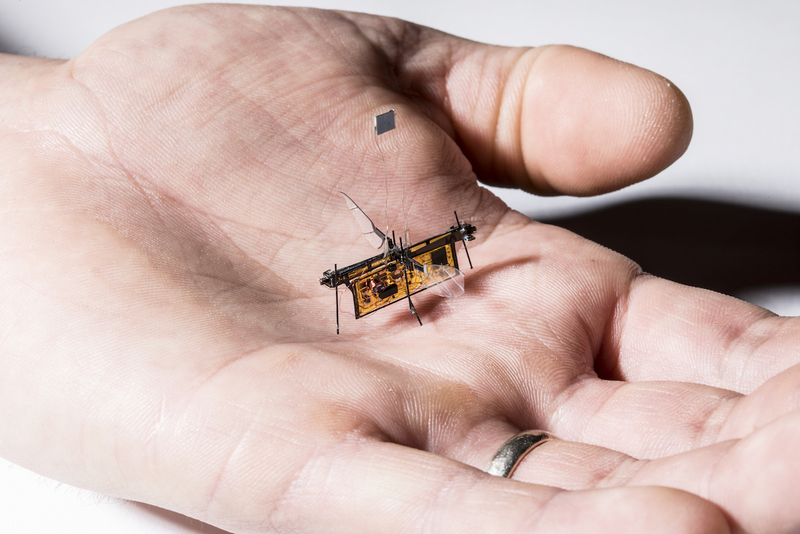 Due to the innovative problem-solving of roboticists from the University of Washington, in Seattle, RoboFly is now the first insect-sized robot to perform untethered flight at its small scale. Currently, the UW team has achieved a range of control of up to 1.23m indoors. However, future developments are looking into increasing this range through the implementation of more powerful lasers. Robofly developers are also looking into the use of lasers that track and indefinitely power the continuous flight of the microbot.